The researchers first developed a theory of ink flow that involves the basic properties of paper and fountain pen. Then they confirmed the theory using rudimentary pens made of tiny glass tubes, glycerin ink, and faux paper etched on the silicon wafers used to produce electronic devices. The team reports its findings in the journal Physical Review Letters. "Writing is one of the most important inventions of human beings," said team leader Ho-Young Kim, professor of mechanical engineering at South Korea’s Seoul National University. "But surprisingly there had been little study of the scientific aspects of the process. This motivated our attempt to understand the phenomenon." "The topic is interesting and the authors are experts," said Howard Stone, a professor of mechanical and aerospace engineering at Princeton University who was not involved in the project. "Their results are impressive." The team identified multiple related physical properties responsible for the transmission of ink from pen to paper. Capillary action allows fluids to flow in thin tubes against the pull of other forces such as gravity. For instance, it causes paint to move up the bristles of a paintbrush, and paper towels to absorb liquid spills through their microscopic, wood-based, cylinder-shaped fibers. Capillary action results from two processes working together. The first is adhesion, or the attachment of a liquid to a solid object, such as water to a glass tube, due to the attraction between the molecules of the liquid and the solid object it contacts. The second is surface tension, the cohesion of liquid molecules on its surface. Surface tension allows liquids to form round drops and insects called water striders to walk across the taut surfaces of ponds. Another important phenomenon is viscosity, a fluid's resistance to flowing. For example, tomato ketchup is more viscous than water. One other factor comes into play: the speed at which the writer moves the pen. 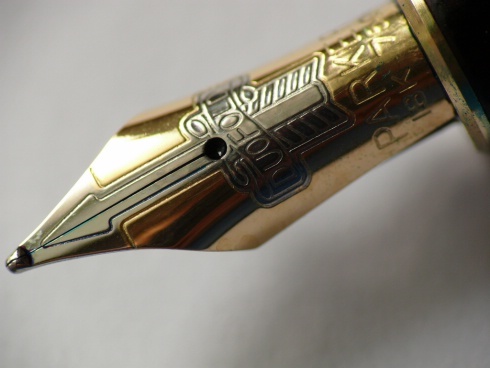 Team member Lakshminarayanan Mahadevan, a professor of mathematics, physics, and biology at Harvard University, explained that the new theory views the process of writing as a competition for the ink between pen and paper. "The pores [in the paper] draw in the fluid via capillary – surface tension – forces, while the viscosity resists this motion," he said. "The moving pen drags along the fluid, and again viscous forces resist this. Together they shape the blot, if one hesitates, and the line when one's thoughts flow from the mind to the machine that records them – the pen." To test their theory, the researchers devised "minimal pens," imitation inks, and jury-rigged “paper." The pens consisted of glass tubes with diameters between half a millimeter and one millimeter. Solutions of glycerin in various concentrations provided the "ink" that filled them. And to mimic paper, the researchers etched tiny pillars, of various heights and separated by distances much less than the pen's diameter, on the surfaces of silicon wafers. Careful observation showed the glycerin ink from the minimal pen flowing into the valleys between the pillars in the faux paper in just the way the team had predicted. "The agreement was excellent," Kim said. The shape of the ink front ahead of the moving pen also confirmed the theory. "Physiologist Douglas Wilkie said that facts and theories are natural enemies," said Mahadevan. "But here they were friends, helping each other along." The researchers emphasized that their theory does not apply to ballpoint pens. "They use fundamentally different ink from what is used in fountain pens," Kim explained. "It doesn’t spread like usual ink." However, Mahadevan said, "We are currently thinking of a different theory for this process." Kim pointed out that, because paper consists of a network of cellulose fibers, the research has implications beyond writing. "Cellulose is the major constituent of plants' cell walls," he said. "Therefore, understanding liquid flow into a cellulose fiber network has a profound implication for water transport in plants. Our work can be used to enhance our understanding of how water can climb up tall trees without mechanical pumps. And there are functional porous materials [based on cellulose] which are particularly useful in biomedical fields." The scientists have taken a new subject for research. It is amazing to know what involves in the process of writing with a fountain pen. Your's is a very interesting post.